Monarch series drums employ a 3-ply configuration, based on very popular drums-1 produced by several drum companies of the 1940’s, 50’s and 60’s. These drums produce a warm, round and punchy tone, with few overtones; they sound equally well along the tuning spectrum, whether tuned high or low. Monarch drums are extremely studio friendly and record exceptionally well. 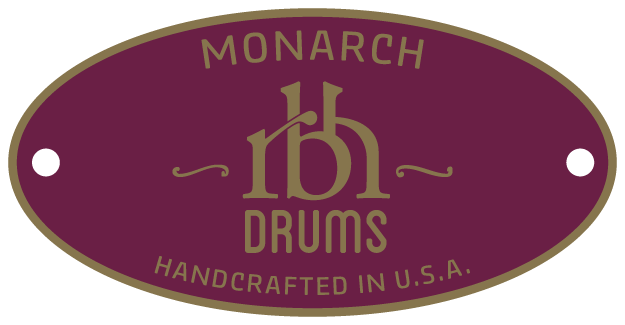 All Monarch drums feature the time honored 3-ply construction which contain a poplar core that is sandwiched between any number of different species of wood. The most common configuration is mahogany-poplar-mahogany, with solid steam bent hard maple reinforcing hoops. 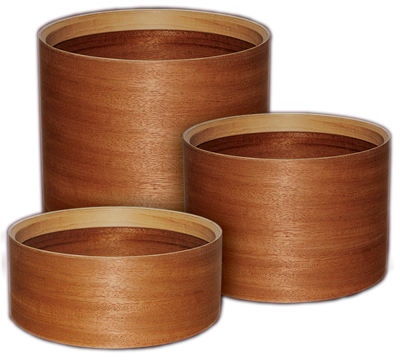 Veneer for Monarch drums is hand selected and cut, glue pressed to a center core of poplar, which is cut from select 1/8” stock, free of knots or voids. Once out of the molds, the raw shells are cut to size and reinforcing hoops applied. After trimming the reinforcing hoops, the shell is thoroughly sanded and ready for finish. – Mike Dawson, Modern Drummer Magazine. Monarch finish consists of hand rubbed penetrating oil and wax, which is buffed to a lustrous elegant sheen. The oil and wax finish is very durable, protective and easily maintained. Peacock confetti wrap is an rbh drums exclusive and is available on any drum upon request. Check with rbh drums for the availability of other wraps and colors. Veneers offered for Monarch exteriors are mahogany, cherry and maple. Other species such as birdseye maple, curly maple, walnut or combinations such as inlays, are available upon request. Take a look at the rbh drums collection in the Photo Gallery. Monarch Series toms’ tuning range is vast. Many vintage drums have one or two sweet spots, however Monarch toms sound full, open, and highly expressive at any tuning. Whether tensioned high for bebop or low and fat for rock and funk, these drums punch through in any playing situation. The bearing edges are cut to a round-over, but 45-degree edges are available. Listen to the Monarch series in action. This track features the Monarch drum kit with: a 20″ bass drum, a 12″ tom, a 14″ tom, and a 6 x 14″ snare. Played by Mike Dawson of Modern Drummer. All bass drums are delivered as virgin instruments. Individual drums can be combined to create custom drum configurations.